Primer is the perfect combination of makeup and skincare. It smoothes the texture and tone of your complexion, prepping it for long-lasting wear, while also delivering good-for-skin ingredients to treat a whole host of issues. For the sake of specificity, some of our favorite primers include Tatcha's Silken Pore Perfecting Sunscreen Broad Spectrum SPF 35 ($65) and Becca First Light Priming Filter Face Primer ($38). Both are silky and comfortable and effective. 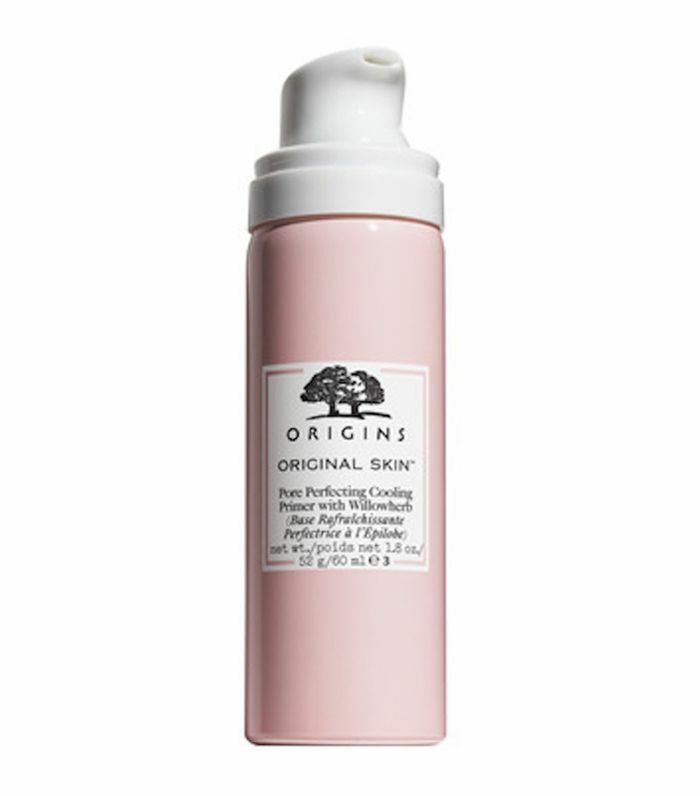 But a new primer from Origins might give those ones a run for their money. It's a totally unique formula and the first of its kind from the brand. It does everything you would expect a primer to do and has brightening, pore-tightening, and anti-aging properties. Plus when it’s applied to the skin, it feels cool to the touch. It's designed like this to target redness and increase circulation. Keep scrolling to see this new and innovative primer. This primer "was created with millennials in mind, targeting quarter-life skin concerns such as enlarged pores, uneven skin tone and rough texture, as these are the first signs of visible aging," the brand said in a press release. "Original Skin collection’s unique ingredients work to de-stress the skin by refining texture, visibly shrinking pores and restoring glow/luminosity – complexion, perfection." Environmental stressors like free radicals and pollution stress the skin every day, leading to earlier and more intense signs of aging, even in 20-somethings. That's why this primer works to protect and "de-stress" the skin, as the brand puts it. The key ingredient is willowherb, which is an ingredient that brings radiance to the skin. There's also a bevy of other botanical extracts including orange, lemon, lavender, and bergamot, spearmint, and ginger. The really unique thing about this primer has to be the cooling application. When you disperse a little of the beige-colored mousse onto your fingertips, you're met with what the brand calls as "ice-cold-on-contact formula." This promises to refresh and soothe the skin while immediately shrinking pores. Interesting, right? Byrdie's editorial director had the chance to try this product out before today's launch. Here's what she had to say. "The product comes out like whipped cream and does feel extremely cold on contact before sinking into the skin. My skin did look slightly smoother after I applied it—it was definitely less shiny. My foundation applied smoothly, but I did notice a little pilling, which could have been more because of my dry skin than anything else." If you're dying for an opportunity to try it too, know that it's currently available at Sephora. Next, see the massive collection of 40 lipsticks that Sephora just launched.